Happy Monday everybody! Did you have a good and relaxing weekend? I worked for the last time at my old job (which I’m quite relieved about I must admit – it’s time to move on), celebrated my flatmates birthday with pizza, wine and friends and did a whole lot of relaxing. The perfect mix in my opinion. Here on the blog, the week starts perfect as well, since the lovely Jessica from Coco/Mingo has created a guest post for Hanna’s Places! I’ve been following her blog for a while and it has slowly become one of my favourites to read, with personal stories and beautiful mood boards. You should definitely head on over and take a look. Greetings all of Hanna’s Places readers! I’m Jessica from over at Coco and Mingo. 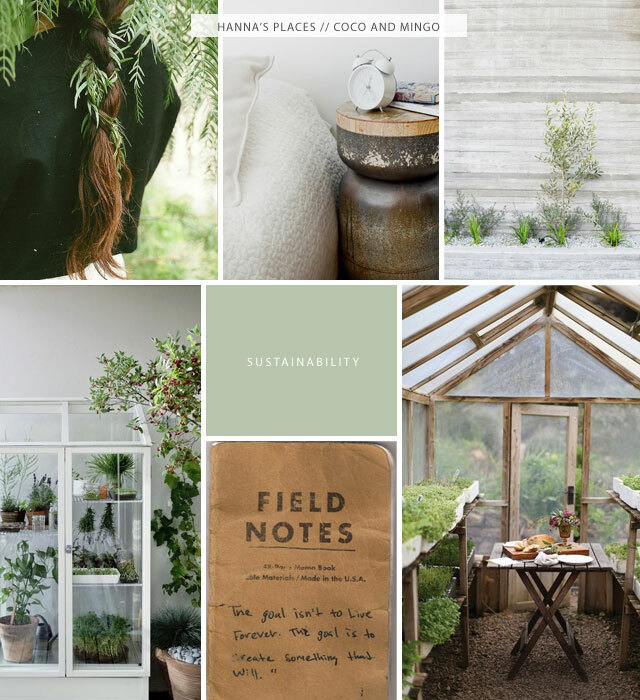 One of the many things that attracted me to Hanna’s blog was her love for sustainability and environmental issues. I’m also a huge fan of our planet Earth and do my best to be as sustainable and eco-friendly as I can. One of the main reasons why I became a vegetarian almost 10 years ago (besides the fact that I love animals too much) is that I learned how harmful to the meat industry impacts the environment! Every action has a reaction and we don’t know how we are negatively impacting our environment until many years down the line so I’ve put together some small ways in which you can help the environment in your own little way. Every bit counts, friends!! So easy! You’d be amazed at what things can be born from recycled products. And those things you can’t recycle? Reuse it and DIY something amazing with it! Help reduce waste by avoiding paper plates, utensils, and other things you know you’ll end up chucking. Reduce also means turning off those lights when you don’t need them, and making sure those leaky faucets are fixed. One of the most basic things you can do to make your yard more sustainable! My family has a beautiful garden with vegetables and my brother just started a compost pile. He adds coffee grinds, veggie and food scraps, and other things to it and it makes the soil so rich. Believe me, adding coffee grinds make your plants, fruits and veggies grow amazingly! When I made the switch over to natural and organic home products, I couldn’t believe how amazing they were! I use Seventh Generation bathroom and home cleaners and they work unbelievably better than chemical filled cleaners like Scrubbing Bubbles and Clorox – not to mention, so gentle on my sensitive hands!! I’m also a huge fan of Mrs. Meyers for hand and dish soap, and laundry detergent – I love it! Choose environmental-friendly whenever possible! This includes recycled and biodegradable products, energy-efficient light bulbs and appliances, solar products for the home, rechargeable batteries, and earth-friendly textiles. Remember, many energy-efficient products and appliances will save you money over the long-run even if they may be more expensive now.